Our offices will be closed from 5.00 pm on Friday 21st December 2018 until 9.00 am on Wednesday 2nd January 2019. Instead of sending Christmas cards this year we are making a donation to Team Angus. Team Angus is a campaign raising money for Angus who was born with Cerebral Palsy, specifically Hypoxic-Ischemic Encephalopathy (HIE). You can read more about Angus’ story here. The money raised will provide physiotherapy, feeding and swallowing intervention and equipment to help Angus have the best possible future. TSP has chosen this charity in support of a client of ours, Toby Wheeler, who has cerebral palsy himself, who is organising a number of fundraising events for Team Angus in 2019. 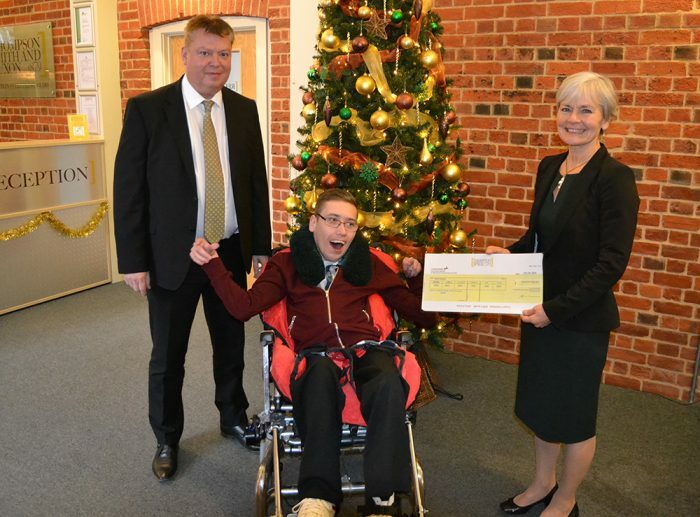 Toby is pictured receiving the donation on behalf of Team Angus from TSP Senior Partner, Mary Anne Fedeyko, and TSP Managing Partner, Steve Webb.